First published in 1952 this is the seventh book in the series. There will be fairly big spoilers for the whole book in this review, so you’ve been warned! This is my absolute favourite book in the Adventure Series, but it nearly didn’t get written. There is a lengthy foreword at the start of it, where Blyton explains she meant to finish the series with The Ship of Adventure, which has Bill and Allie agreeing to marry at the end of it. 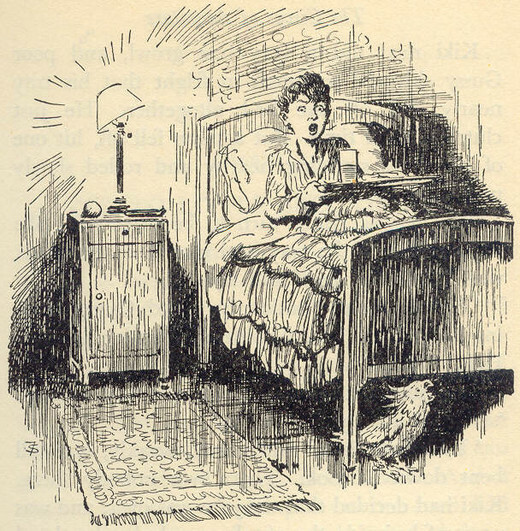 But, much like with the Famous Five, her readers demanded she continue, and continue she did! And thank goodness for that! We are briefly at what we must now refer to as ‘the Cunningham house’ at the start of the book, but we are quickly off with the Cunningham/Mannering/Trents to Little Brockleton. As the name suggests there are badgers in the vicinity, down by the old quarry which gives their cottage its name – Quarry Cottage. There’s also a strangely-shaped hill nearby, giving it an equally strange name – Sugar-Loaf Hill. After Little Brockleton is the wonderful country of Tauri-Hessia, which is a completely made-up country, presumably in Eastern Europe somewhere. We actually don’t see very much of the baddies in this book; they’re rather behind-the-scenes, plotting and scheming and having others carry out their evil deeds. Behind it all is Madame Tatiosa, the wife of the Prime Minister of Tauri-Hessia, working in conjunction with her husband and Count Paritolen. When we do see them though, they’re rather sinister figures, calm and controlled and also surprisingly polite for would-be-killers. The major additional character for this book has to be Gussy, or to give him his full name Prince Aloysius Gramondie Racemolie Torquinel of Tauri-Hessia! At first we know him as just Gussy, (or Fussy-Gussy as Kiki calls him), and he’s rather a strange boy. He has long hair – something no well-to-do English boy of the time would dream of having – he speaks rather oddly, and he behaves in a very demanding and spoiled way. Of course we learn fairly soon that he’s a prince, smuggled out of his country in an attempt to foil an evil plan, so his behaviour suddenly doesn’t seem so bad. I do find Gussy very funny, though he’s not intentionally humerus. His missayings are amusing and he reacts so badly to Kiki’s teasing, it always makes me laugh. There are also a number of circus-folk that we meet. Pedro, a half-Spanish and half-English boy, is probably the most important one, he takes Jack under his wing and introduces him to the other circus folk, many of whom become allies in the adventure. There’s Pedro’s mother, or Ma as she’s known, The Boss, Fank the bear trainer, Madame Fifi who has two chimpanzees, Toni and Bingo the acrobats and Hola the sword swallower. They’re a colourful bunch of people and they’re indispensable when it comes the drawn-out rescuing of the children. 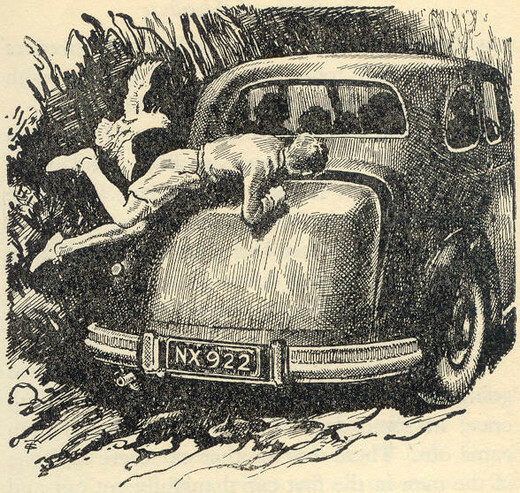 The adventure starts properly when Bill and Allie get lured away from the cottage one night, and Gussy, Philip, Lucy-Ann and Dinah get kidnapped. Only Jack manages to avoid getting captured as he’s been out at the quarry watching for owls. He returns just in time to hitch a ride on the car the children have been bundled into, and secretly follows them all the way to an airport. He then manages to get on the same plane as them, and finds himself in Tauri-Hessia. He doesn’t speak the language and he has no ID card, so he has a rather frightening brush with the law, but ever resourceful he manages to wriggle out of it. A helpful old man directs him to the surky, or as we’d say circus, mostly because of Kiki. There he meets Pedro, and after some halting French, he’s invited in for some food. Handily Pedro speaks English too though! That can’t be comfortable, Jack! 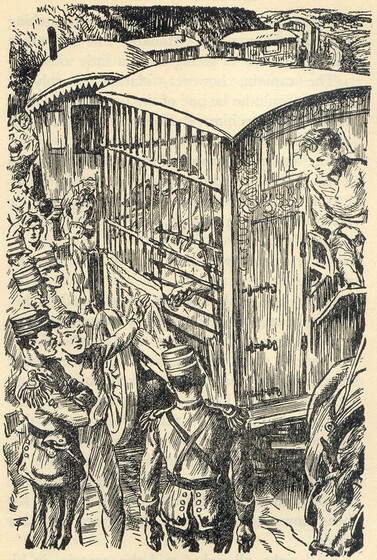 Conveniently, the circus is heading to Borken, where Jack figures the children are being held. He does some reconnaissance around the castle, and then takes Pedro into his confidence. 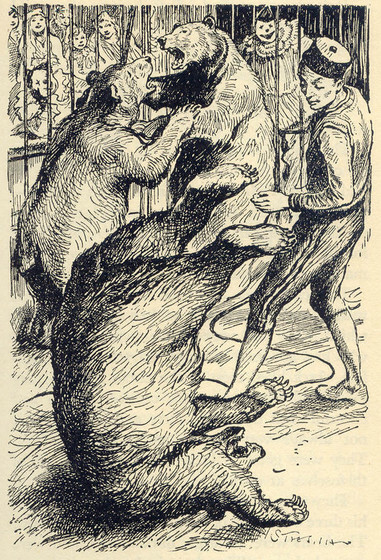 With Toni and Bingo’s help they rescue all four children, and they hide with the circus folk – but soldiers are out hunting for the prince, and they search the circus as it moves on from Borken. Are the children’s disguises good enough? You’ll have to read it and find out. Philip picks up a tiny dormouse on the way up Sugar-Loaf hill, and he calls it Snoozy. 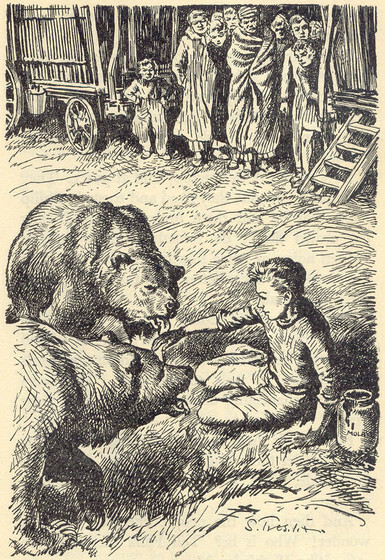 Though not technically his pets, Philip does spend some time with Fank’s three bears, and he is the only one able to calm them down while Fank is ill in bed. It’s the first time we see Philip with such dangerously large animals, and it makes for some very dramatic reading. I don’t know where to start with my favourite parts. I love the whole book! Gussy is hilarious, as I’ve said, especially in conjunction with that Kiki, or wicket bird as he calls her. His mispronunciations are brilliant, it spiks he says of Kiki, and I blid! when she scratches his finger. 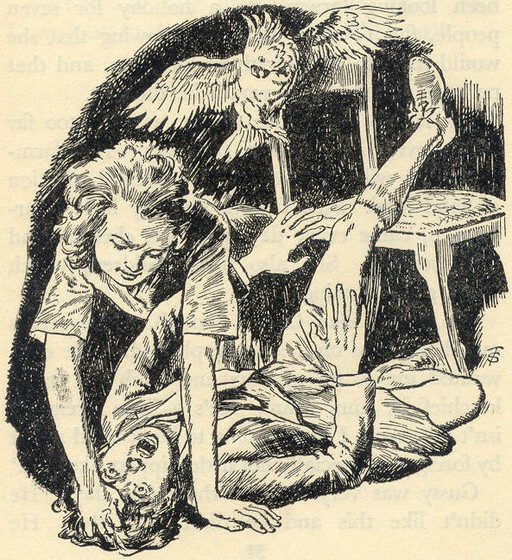 The circus-folk are all interesting, and they manage to be different from the many other circus or fair folk we see in many other Blyton books. If you forced me to choose, I would have to pick two three favourite parts. I could list a hundred other scenes, but I won’t. Honourable mentions go to Bill in a false moustache, Pedro and Jack speaking in French before Jack realises he knows English, Dinah wrestling Gussy to the floor in a fit of anger, the rescue itself, Gussy’s ‘pocket money’, the soldiers searching the circus, Madame Fifi’s bravery, and finally Pah, safftee net! Phew. In a way this is an unusual story for the Adventure series, as for quite a big chunk we’re only with Jack. We don’t know what’s going on with the other three at all, not until Jack meets up with them again. We do go back to a more typical format in other respects though; the children do tumble into adventure and Bill shows up at the end. The family has had another chance, as I said at the start, Bill and Allie get married. So Allie is now Mrs Cunningham, and it would seem Bill has moved in with them. He’s still Bill to the children, and Allie is still Aunt Allie to Jack and Lucy-Ann, so they’re still not the most ‘conventional family’, but it seems to work for them. And there you have it, my favourite book of the series! This entry was posted in Book reviews and tagged The Adventure Series, The Circus of Adventure. Bookmark the permalink. It seems as though marriage to Allie has not stopped Bill getting involved in desperate goings on. Perhaps she thought that all would be safe and secure once they married! I haven’t read this book since the 1950s so thank you Fiona for inspiring me to read it again. What a shocking confession Francis! I order you to go read it as soon as possible! Fiona, it’s such a pleasure to read your Adventure series reviews! The scenes you listed as favorite scenes are among my favorites as well. I also enjoyed the secret passages in-between the rooms inside the Borken castle and the very thrilling rescue from the high (bell?) tower. When I read “Circus” for the first time (I think this was my first Adventure book as I didn’t get them in chronological order), I was so impressed with Bill’s disguise and how he managed to appear as one of the circus folks. I don’t know if you have read “Mountain” already, but Bill has a very impressive and (at least to me) very unexpected appearance, too. Even though I never really enjoyed “Mountain”, but I like the book from the scene on when Bill appears. I will have to stop very soon, Chrissie, as there’s only one more book to review! Don’t worry, though, as I will move on to another series sooner or later, though I haven’t decided what it’ll be. I read (and reviewed) Mountain a few weeks ago, though I didn’t pick up on that similarity. You’re right though, Bill turns up most unexpectedly both times. Well what you said is correct! On the Mountain series, well, the fantasy partis really strong. Especially when the four saw the red miraculous magical light and they floats, I feel like floating! Fiona, how about reviewing the Adventurous Four? It’s only 2 volumes and a novella/short story. But the books definitely influenced the Adventure series. A most enjoyable review. This book is perhaps the one Adventure book I have read the least…I must rectify that as soon as possible. Hey! That was a really good review! Have you read the Sea of Adventure and The River of Adventure? Well, I love all of the Adventure Series so, er, all of them are brilliant. I have read all of them. It’s a deep pleasure to found a website like these! I hope your site grow larger, Francis. Love! Omg sorry I mean Fiona! Or even, Stef as this was her post? 🙂 But thanks either way!